Let's be real for a minute. When I signed up for this working-from-home-mom business I pictured it pretty different from reality. In my vision, I am peacefully designing during naptime, earning the big bucks from working minimal hours, and my house is always clean because I am also simultaneously, the ideal housewife. Well all I can say to that is - HA! 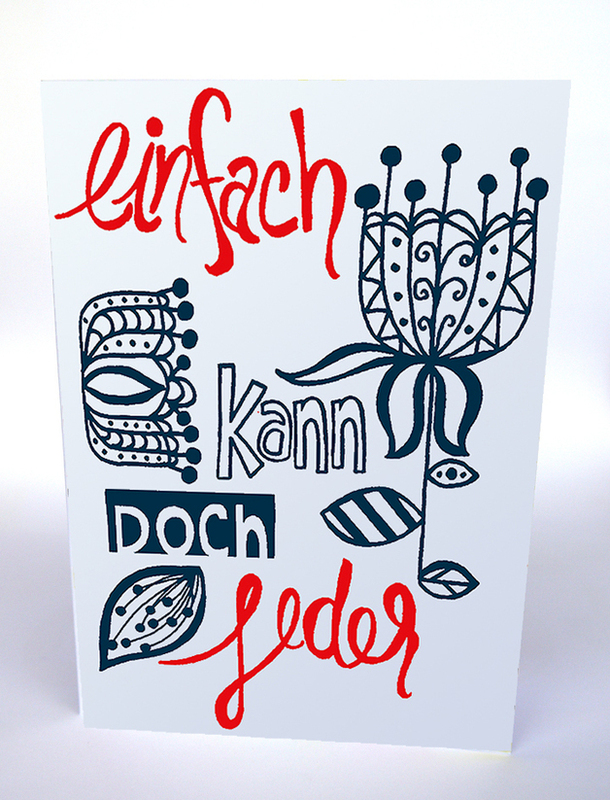 This card translates to "Everyone can do easy." and though the road of being a work at home mom has lots of great moments, easy it is not. Because while I can say that my stationery line, Rae Schmae, is now available at several boutiques in Berlin (yay!) don't be fooled into thinking that I, in a very cosmopolitan outfit, made appointments with boutiques that I penciled into my dayplanner to which I showed up with a professional display and press packet and we all sipped espressos while talking business. No. This is more like it: Its 95 degrees and humid - my hair is up in a messy bun and frizzing out. I am pushing / lugging up and down stairs a baby stroller with an under-napped 6 month old, and have a bored 6 year old bumbling behind me. I pop into a stores that I happen to wander past (and some I have Googled ahead of time) and ask in my less-than-perfect German if I can share the box of samples I have in the bottom of my stroller behind the diaper bag.